Raven shaking the snow off. 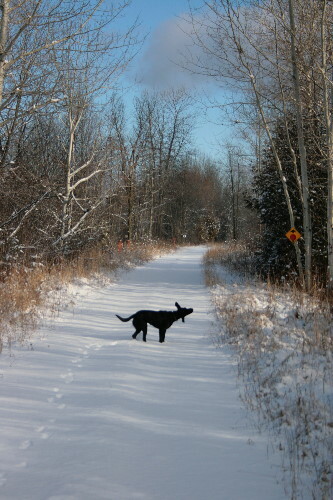 The trail is used by snowmobilers in the winter, and where it crosses the road there are cute mini versions of street signs to direct the snowmobile traffic. So I got to the end of the property and decided, what the heck, I’d walk a little bit farther. Raven, who has more energy packed into her little 45-pound frame than can possibly originate from a few cups of dry kibble, would have been happy to hike to Perth and back. Me, not so much. It was cold, and I had stuff to get back to. But I thought going down to the bridge that I had seen from the highway when I drive by would be a manageable distance. 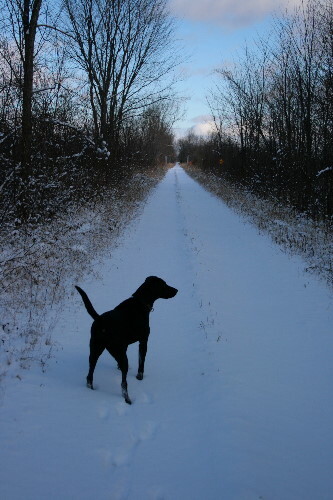 Raven thinks we're headed to the 100-acre woods, and starts turning off the rail bed toward the property entrance when we get there. Not today, pup! 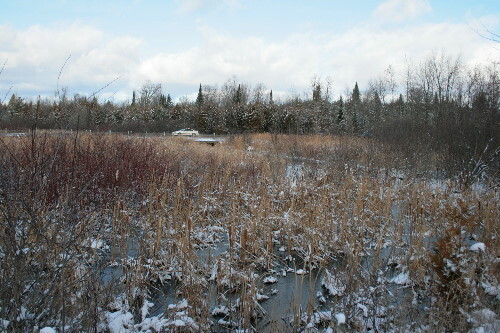 Along parts of it the bed passes through what looked like it had been a wet depression bordering on swamp. 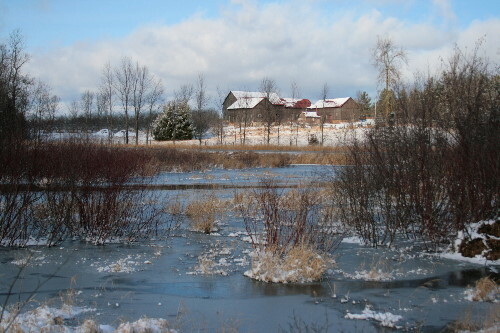 The large, possibly vernal, woodland pools were covered in ice now. 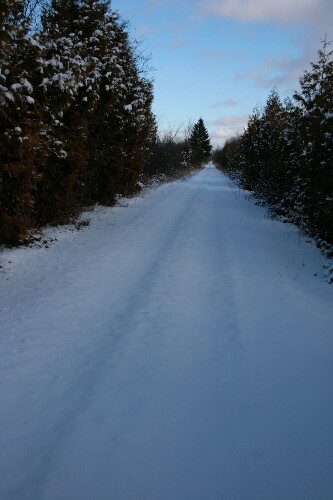 The “trail” is a retired railway bed, and as such it’s broad and flat. In the summer it’s loosely covered in gravel; in the winter it’s loosely covered in snow. I don’t think it ever gets plowed, I suspect they count on snowmobiles to pack the snow down, if they worry about snow maintenance at all. 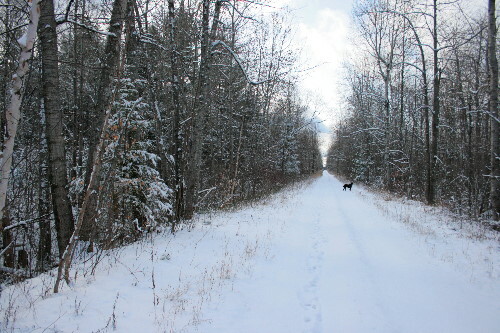 When we stepped out onto it the trail stretched out ahead of us pristine and clear of tracks. I don’t know how much use the trail actually gets. I’ve walked along it a few times, and only ever seen one other person on it, an ATVer back in the fall. 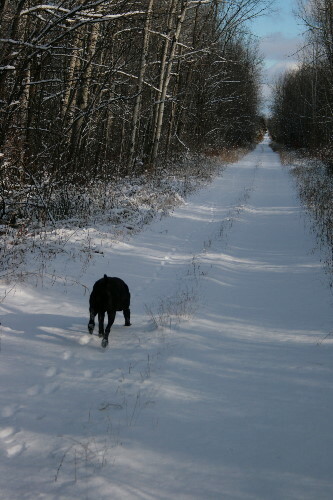 I’d gotten so used to the trail being empty, the ATVer rather startled me. We met up with a line of tracks in one spot. They were large, and straight, and looked like a canine trotting. Somebody's pet, roaming the neighbourhood? Coyote? Perhaps one of the foxes I keep seeing signs of? Raven, who had been sniffing out something behind me in the previous photo, now charges ahead again. She doesn't know what made the tracks, either, but they sure smell interesting. Curious about the history of the trail, I called my dad, who readers of my mom’s blog will know as Railguy. He gave me a bunch of leads that helped get me started on a Google search for more information. 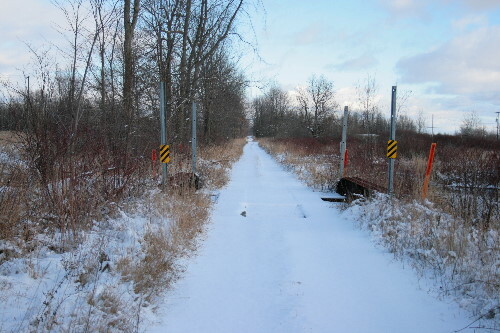 Turns out, the rail bed itself was built in 1884 as the main through line from Perth to Toronto of the Ontario & Quebec Railway (incidentally, the OQR was acquired through perpetual lease by Canadian Pacific Railway, CPR, that same year, so it never got a chance to operate as an independent OQR line). 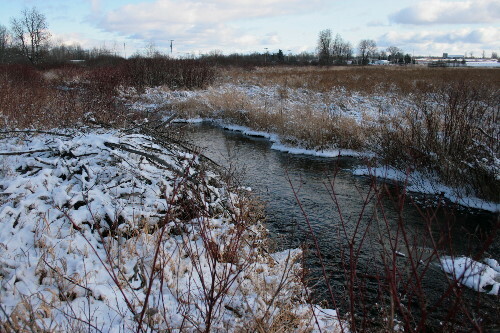 The route starts just west of Perth in the hamlet of Glen Tay, where it branches from another CPR line, and runs west through several small Ontario towns to Peterborough, and then southwest to Toronto. The rail line was essentially completed May 5 of 1884, but the first train didn’t travel the line until August 11, due to delays caused by a sinkhole some 60 kilometers (38 miles) west of here near Kaladar. There's that blue, blue sky again. It's funny how dark it looks because the sun is low in the sky already, even though it's just after noon. 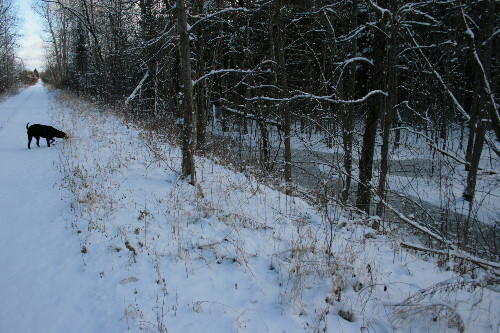 Standing on the rail bed, looking toward the bridge over the creek along Highway 7. I waited for a car to come by to better show how close it is. Sorta takes away from the nature-y-ness of it to have traffic rumbling away so close. Less than 15 years after opening, the Perth-Toronto line had become so well-traveled that there was discussion about widening the bed and laying down a second, parallel track. Surveys were completed in 1898 to assess feasibility and cost in straightening the line and reducing the grade (built at 1.1%, they wanted to reduce it to 0.8%). Some 17 locations totaling half of the length of the line would require fixing, and the decision was made instead to build further south, paralleling the shore of Lake Ontario, which had a better grade and didn’t require crossing the Canadian Shield (ie., could be built much straighter). A section lined by cedars on both sides. And a rare instance where Raven had fallen behind. Look at that clean, unblemished snow. Coming up on the bridge, I can just see it in the distance. As passenger travel gave way from trains to automobiles, service along this line would likely have become primarily freight, and then even that eventually mostly shifted down to the lakeshore line, since the easier grade allowed trains to move faster and haul more. Finally, in July 1971, 87 years after it was laid, the track between Glen Tay and the small town of Tweed was retired from service. Sixteen years later, in 1987, the second half of that line “subdivision”, from Tweed to Havelock, was discontinued. My favourite photo of the outing. All the pieces just came together compositionally for this one. 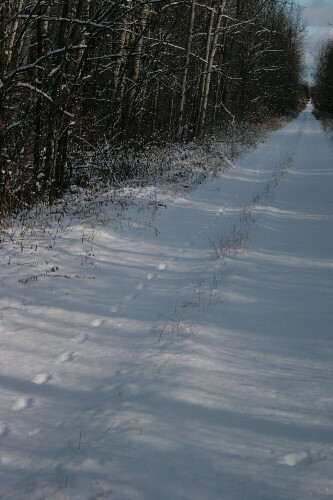 The highway lies between me and the barn, but you can't even tell. Maybe I could sell them a print. 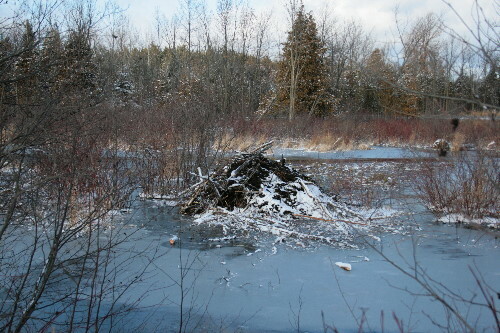 A beaver lodge just to the left of the barn. Didn't see any beavers, or even any signs of beaver activity, so I'm not sure if it's still active. The old bridge. Judging by the state of the wooden crossties, this might be the original bridge installed in 1884. Or perhaps it was a replacement made in the early decades of the 1900s. It looks as though it's been around quite a long time, in any case. Standing on the bridge, looking south. You can just make out the farms on the crossroad. I didn't realize the bridge was this close to the crossroad, or I might have thought twice about walking down. It was 1.5 km (0.9 mi) along the railbed each way, plus 0.75 km (0.5 mi) there and back to the rear of our property - a 4.5 km (2.8 mi) round trip when I'd left the house just planning on doing one! I searched and searched looking for any indication that this section was part of a formal trail system, but was unable to find anything. 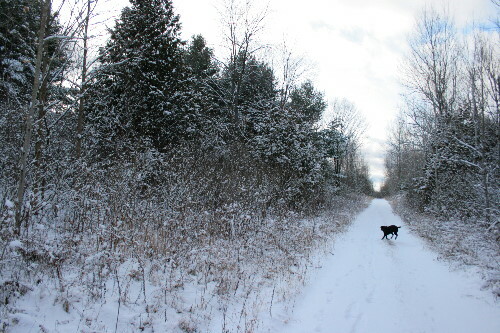 Some 25 kilometers (16 miles) west of here, the retired line from Sharbot Lake west to Kaladar has been incorporated into the Trans Canada Trail. At Sharbot Lake, instead of continuing east along the line, the TCT jogs southward and actually passes near our old house, going through the south of Frontenac Provincial Park. 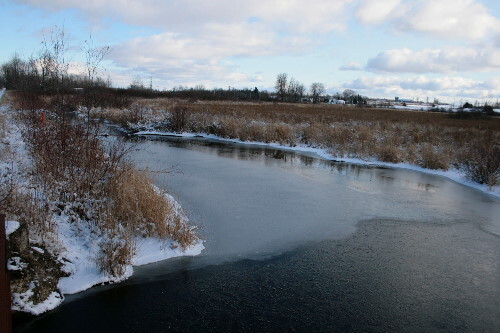 It then returns north, ending up 30 kilometers (19 miles) east of here, in Smiths Falls. I’m not sure why they didn’t just run the trail straight through. It’s not even listed as an “alternate route” as some trail systems sometimes offer. This looks like it might once have been another beaver lodge. Or maybe just a pile of sticks that someone cleared from cutting up a few trail-infringing saplings? With the sun low and clouds periodically sweeping through, the light did some neat things during the walk. 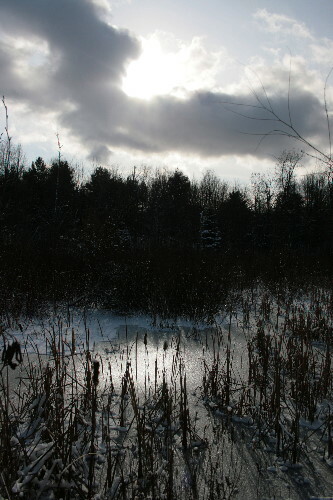 This was the best photo of a light-effect, with the sun reflecting off the ice. 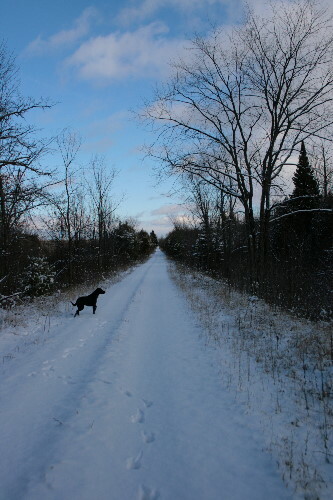 The only spot I could find this section of rail bed formally recognized as a recreational trail was on the website of the Eastern Ontario Trail Alliance. They provide a map on their website which shows trails throughout Shield Country. They mark this section of the rail bed in purple. Unfortunately, the resolution of the map is too small for me to be able to determine what purple means. I suspect they represent things like multi-use, pedestrian, ATV/snowmobile, etc. It’s different from the yellow and green trails, though, whatever it is. Raven looks like she's 200 feet ahead of me, but it's only because I'm using the wide-angle; she keeps to a pretty regular 50 feet in front, glancing back regularly to make sure I'm still following her. Here she's noticed I've stopped to take a photo, and has stopped to wait for me. She'd paused to sniff something, and lost a precious 25 feet of lead-space, which she now bounds off to make up. I’m thinking I should start eating dry dog kibble. Must be good stuff. I wish I knew her secret. Maybe she snacks on powerbars when we’re not watching. 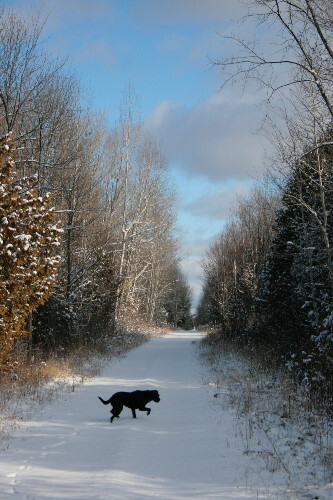 Ooo, makes me want to get some cross-country skis! We’ve got snow now in Saint John, although the first batch of it has gotten pretty crunchy. We have a set of cross-country skis, Lavenderbay, left here by our landlady for us to use, and I’ll admit the nice level, wide trail makes me want to pull them out and give them a try. It’s been so long since I last skied, though, I have some doubts about how far I’d actually get! Great to see you around again! We’ve missed you!